Tejasvi Surya was chosen by the BJP as the candidate from the Bengaluru (South) constituency although Tejaswini Ananthkumar was widely tipped to contest from the seat. Tejaswini Ananthkumar has clarified that she has not endorsed a campaign to vote NOTA in Bengaluru (South) constituency in the Lok Sabha elections. 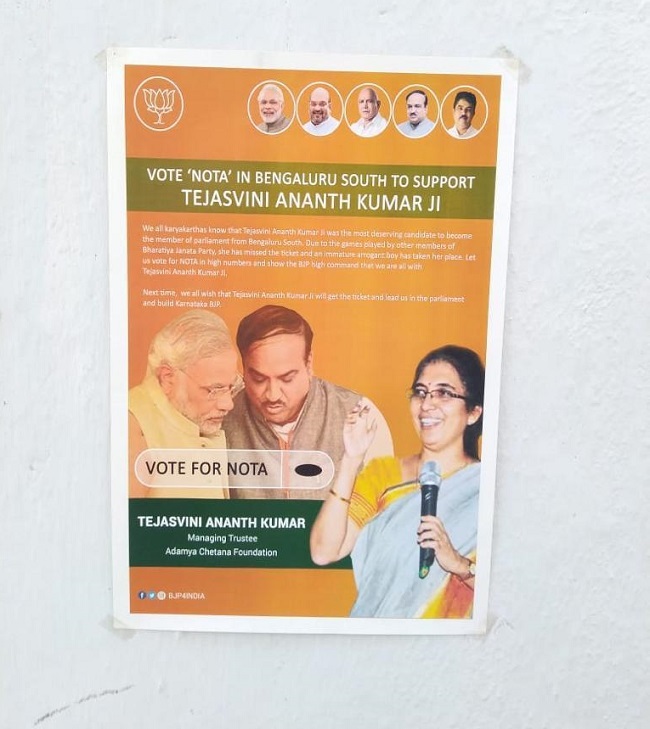 The poster asked voters to vote NOTA in order to show the BJP high command that their preferred choice of candidate was Tejaswini Ananthkumar. "We all karyakartas know that Tejaswini Ananth Kumar was the most deserving candidate to become MP from Bengaluru (South). Due to games played by other members of BJP, she has missed the ticket and an immature arrogant boy has taken her place. Let us vote NOTA in high numbers and show the high command that we are with Tejaswini Ananth Kumar. Tejaswini was widely tipped to be named as the BJP candidate from Bengaluru (South) constituency. She is the wife of Ananth Kumar, former MP and union minister from the same constituency who passed away in November 2018. Ananth Kumar had won the last six elections from the constituency. However, her name did not figure in the list of candidates released by the BJP and young lawyer Tejasvi Surya was picked by the party instead.